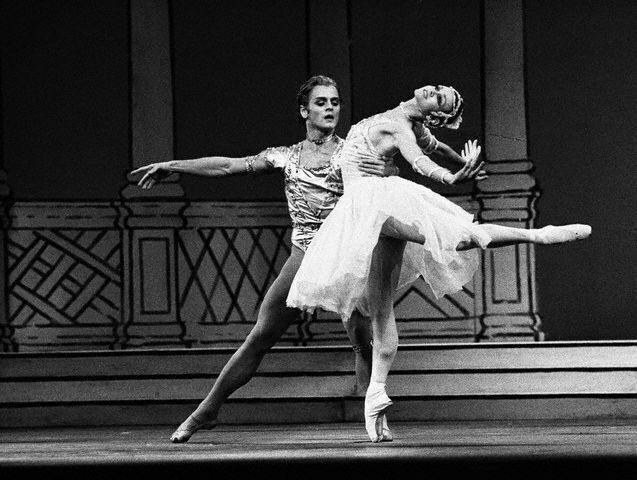 Hallberg and Osipova in Ratmansky's Valse Triste. Johan Persson, Courtesy New York City Center. In recent years, Royal Ballet principal and international touring artist Natalia Osipova has curated her own evenings of new works, collaborating with a slew of contemporary choreographers. The newest of these is Pure Dance, which premiered last September at Sadler's Wells and comes to New York City Center April 3–6. "I really like to try new things," she told the Financial Times last year. "There is something in my personality that makes me want to start new projects." Natalia Osipova as Isadora with Emily Anderson as Terpsichore. Photo by Doug Gifford, Courtesy Segerstrom Center for the Arts. Since stepping down as a Bolshoi Ballet principal in 2011, prima ballerina Natalia Osipova, now a principal with The Royal Ballet, has been on a quest to express her own artistic voice. This month she takes another stride on that path by starring in ISADORA, an evening-length narrative work about Isadora Duncan that premieres August 10–12 at the Segerstrom Center for the Arts in Costa Mesa, California. Hallberg speaking at a Bolshoi press conference before the premiere of "The Sleeping Beauty." ITAR-TASS Photo Agency/Alamy Stock Photo, Courtesy Simon & Schuster, Inc.
"Do you still love ballet?" I ask David Hallberg as we sit in a drab conference room at American Ballet Theatre discussing his new memoir, A Body of Work: Dancing to the Edge and Back. The book details Hallberg's grueling return from a series of injuries that left him questioning whether he would ever dance again. "Yes, I love it even more," he says almost hungrily, as he stares me down with his searching, slightly hollow gaze. A Body of Work is not an easy read. Its final section, devoted to the long road back from injury and despair, is the most distressing, but what comes before is not much lighter. The self-portrait Hallberg has outlined is stark: a boy, and later a man, propelled by a single-minded drive, subjected to savage bullying at school in Arizona; ostracism during a year of studies at the Paris Opéra Ballet School; arduous private training that has his parents half-joking about appealing to child services; un-empathetic partners; a punishing work schedule that leaves his body broken. All this, in order to satisfy the "gravitational force" of ballet, which he feels "pulling [him] in deeper and deeper," he writes. Osipova and Sergei Polunin in Arthur Pita's Run Mary Run. Photo by Bill Cooper, Courtesy Sadler's Wells. Natalia Osipova, the Moscow-born principal of The Royal Ballet, has teamed up with London's Sadler's Wells Theatre to present Natalia Osipova & Artists, which will be making its U.S. premiere at New York City Center from November 10–12. (One piece on the program, Russell Maliphant's Silent Echo, debuted August 27 in Los Angeles.) This surprising triple bill has given Osipova free rein to explore her contemporary side while working with some of the world's most important choreographers (Arthur Pita, Sidi Larbi Cherkaoui and Maliphant) as well as her romantic partner, ballet dancer Sergei Polunin. With the help of a translator, Pointe sat down with the 30-year-old Osipova and discussed ballet, contemporary dance and that moment and place where the personal and the professional meet. What was the reason for creating a show featuring contemporary works rather than ballet? I was always interested in contemporary dance—even in ballet school, I would follow it. Also, when one dances classical ballet all the time, you have to spice things up, so I choose to try different things. In a way, it's all part of a creative search. I wouldn't say I'm bored dancing classical pieces, I'd simply like to learn other languages of dance, as well. How has the show been received? As usual, there were good and bad reviews. I couldn't really single out what specifically people objected to in the bad reviews, not because I don't listen to critics—it's a very hard profession and I'm used to critics of all kinds—but I don't peruse every little detail and then try to reconcile it. In Russell Maliphant's Silent Echo. Photo by Bill Cooper, Courtesy Sadler's Wells. Each piece was created especially for you. At the Edinburgh International Festival, the audience was particularly impressed with Russell Maliphant's Silent Echo. How involved were you in its creation? Normally, I don't interfere, but I initially met with Russell and discussed it, and it was clear from the beginning that I would be dancing with Sergei. But the rest was left up to him. In this contemporary sphere, I trust the choreographer, whereas in a classical ballet, I might have discussions with the choreographer in order to introduce my own idiosyncrasies into pieces. Is that because you're new to contemporary dance and less comfortable with it? Classical ballet is my native language, so there is room for me to deliver something of my own within it. With contemporary dance, I simply don't feel like I am at the level where I can give input. I'm still learning that language. How did you and Sergei Polunin meet? We met about a year and a half ago while working on Giselle at La Scala in Milan. The partner who was scheduled to dance with me was ill, so I asked him to fill the role. There was something in the air about dancing with Sergei. My mother even mentioned that he might be an interesting dance partner. So in a way it was in the cards. You must have heard he was being called the “bad boy of ballet" as rumors of him throwing fits and storming offstage surfaced. What did you expect working with him to be like? I had certainly heard of Sergei's reputation before working with him, but I understand well how things are very often exaggerated. So I didn't pay much attention. In the end, I wasn't going to dance with his reputation, I was going to dance with the real person. In Pita's Run Mary Run. Photo by Bill Cooper, Courtesy Sadler's Wells. I met him after he gained that “bad boy" reputation, so I can only judge him as he is now. He certainly is quite outspoken. But the person that I work with and that I am together with is fairly levelheaded and very genuine. He is possibly a little more settled now. The situations that occurred previously happened for real reasons. He behaved as he did as a sincere creative person, there was no unnecessary theatricality. It must be difficult to maintain a relationship when you work with different companies and are constantly touring. Was this production, at least in part, a way to spend more time together? The show was already in motion at the time when we met, so it was not made specifically so that we could dance together, but it was a happy coincidence. What are the best and worst parts of working with your significant other? The most difficult part is that any outburst or critique during rehearsals is more open, so conflicts do arise. And as I am a young woman, it is easier for me to sometimes give way in these conflicts; and sometimes they carry on into our personal lives a little bit. The positives, however, are obvious. The feeling of being onstage together and dancing together and creating something together is incomparable. After months of anticipation, it's finally here. Dancer, the long-awaited documentary of international ballet star Sergei Polunin, had its world premiere in Los Angeles September 9, and opens in New York and on demand this Friday, September 16. It will also play in selected cities across the country. Through intimate childhood home videos, performance footage and in-depth interviews with his family, friends and even detractors, Dancer aims to unpack the complicated, controversial life of the former Royal Ballet star. As you may recall, Polunin made headlines several years ago for walking out on his principal contract at age 22—and for his very public, self-sabotaging behavior. But the movie also reveals his troubled home life, the enormous sacrifices his family made for him, and his inner turmoil over whether to continue dancing. In this clip, we see him spiraling out of control, exhausted and stifled by his heavy commitments with The Royal Ballet. Bolstered by its eccentric characters, Coppélia has comic flare like no other ballet. In this 2009 rendition staged by Sergei Vikharev, Natalia Osipova, a then 23-year-old Bolshoi Ballet soloist, storms the stage in Swanhilda’s variation from Act III. It would be another year before her promotion in 2010, but here Osipova demonstrates all of the ideal qualities of a principal dancer: articulated feet, expressive arms, an emotional parallel with the character that comes from years of experience and, of course, flawless technique. After being reunited with her beloved Franz, she leaps (quite literally) onstage with confidence. The variation is fashioned with jumps, and though petite, Osipova seems to defy gravity, proving once again why her jumps are famous worldwide. She dives into each step with ease, showing a mesmerizing certainty in her ability (specifically after her soutenous at 1:10, before she begins an endless stream of développés and pirouettes). In the final seconds of the variation, Osipova’s delicate upper body captures the lighthearted nature of the ballet so well. Now a principal with the Royal Ballet, Osipova has shown an interest in contemporary ballet. Just recently, she traded in her tutu to appear in an evening of contemporary work by Sidi Larbi Cherkaoui, Russell Maliphant and Arthur Pita. Now that she has our attention, we wait in anticipation of her next performance! Happy #ThrowbackThursday! Polunin in David LaChapelle's video to Hozier's "Take Me to Church." Photo via Dance Magazine. There are times when Sergei Polunin's life seems straight out of a movie. From his notorious rebelliousness—exemplified by his shocking decision to walk away from his promising career at The Royal Ballet—to his glamorous relationship with Natalia Osipova to his trademark tattoos, the international ballet superstar has had his fair share of drama. We can never predict what he's going to do next, but let's face it—that's part of the reason we love him. So when we heard there would be a new documentary about his life, it seemed only fitting. The trailer for the film, Dancer, was just released, and from the looks of it, there will be tons of jaw-dropping footage of Polunin in motion. In case we needed a reminder of how powerful this can be, the trailer is set to Hozier's "Take Me to Church," bringing to mind his passionate, soaring moves in last year's viral YouTube video. It also looks like the film will dig into Polunin's challenging past, with the trailer alluding to family drama and inner turmoil. Photo by Nobby Clark/Arena PAL via The Royal Opera House on Flickr. Sir Frederick Ashton created his 1980 ballet Rhapsody in honor of Elizabeth The Queen Mother (mother of Elizabeth II) for her 80th birthday. I’d say this serene, elegant pas de deux is fit for a queen—and for the strengths of its lead dancers, Mikhail Baryshnikov and Lesley Collier, on whom the roles were created. In her shimmering blush-pink dress, Collier wafts across the stage, feet fluttering to the piano’s peaceful notes. With his effortless partnering and her full, graceful port de bras, it seems as if there’s no transition from floor to air. My favorite moment is when Collier ducks under each of Baryshnikov’s arms and he reacts with a barely-there embrace, eyes gazing outwards. They strike a perfect balance between dancing for themselves, for each other and for us. Baryshnikov actually requested the commission for Rhapsody. Judging by the thriving success of the Baryshnikov Arts Center, the creation and performance space he founded in New York City 25 years later, he’ll continue to be a pioneer in the arts for years to come. Lesley Collier became a widely respected coach and teacher after her retirement from the stage. Below, watch her lead Royal Ballet principals Natalia Osipova and Steven McRae in rehearsals for the sublime ballet she starred in. Happy #FlashBackFriday! 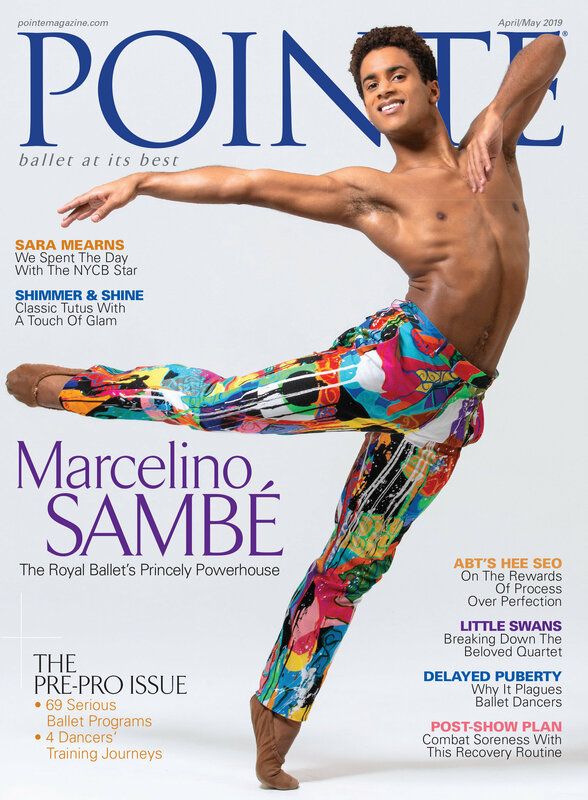 For more news on all things ballet, don’t miss a single issue. Photo by Nikolay Krusser via Splash Magazine. When this La Bayadère clip was filmed in 2008, Natalia Osipova was two years away from breaking into the Bolshoi Ballet’s highest rank. Though she doesn’t play the tragic heroine in this performance, it’s actually a treat to watch Osipova in a purely technical soloist role. Despite the ethereal-sounding name, the second Shade variation is no delicate, airy solo. Osipova devours space, both horizontally and vertically with her famously explosive jump. But she doesn’t sacrifice details for airtime. The controlled stationary steps, like those perfectly crossed relevé attitudes, are all the more impressive for having followed such a leg-tiring sequence (well, for any other human). Osipova won the prestigious Benois de la Danse award for Best Female Dancer that same year. She joined The Royal Ballet as a principal in 2013, where she recently created the role of Amélie Gautreau in Christopher Wheeldon’s Strapless. Happy #ThrowbackThursday! What's more exciting than two of ballet's biggest superstars dancing together in a new contemporary program at Sadler's Wells? How about finding out they're a couple in real life, too? Well, it's official. This week, Royal Ballet principal Natalia Osipova and Stanislavsky dancer Sergei Polunin (who also made waves dancing in a viral video to Hozier's "Take Me to Church" earlier this year) confirmed the rumors that have been flying around for months when they announced that they are, in fact, in a relationship. They're also longing to dance together more often, and claim that classical companies are resistant to letting them be partners onstage. The two performed together in Giselle at La Scala earlier this year, but haven't been able to do so again since. Natalia Osipova and Ivan Vasiliev in rehearsal. Joe Toreno. When former Bolshoi stars Natalia Osipova and Ivan Vasiliev called off their engagement in 2013, fans wondered whether their spectacular onstage partnership was over as well. On their breaks from St. Petersburg's Mikhailovsky Ballet, where both are now principals, she guested with The Royal Ballet while he toured with Kings of the Dance and told the press that maybe, someday, they would dance together again. In July 2014, they reunited in Solo for Two, a self-curated evening of contemporary choreography created for them by Ohad Naharin, Arthur Pita and Sidi Larbi Cherkaoui. The premiere at Orange County's Segerstrom Center for the Arts marked their return to performing together and a new stage in their artistic lives, defined by creative freedom and self-determination (performances in London and Moscow followed). “In classical dance, you follow the rules," Osipova explains. “In contemporary dance, you have no rules. I love that feeling of freedom."